Southern Arkansas University’s Cameron Bailey, of Nash, was honored with the opportunity to be the young adult guest speaker at the 12th Annual African American History Celebration held at SAU on February 28, 2016. Even though it was the 22-year old Texan’s first time speaking to such a large audience, Bailey’s anxiety was calmed by the feedback and encouragement of the community. 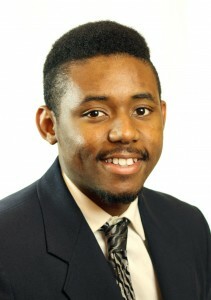 During his college career, Bailey has been involved in numerous leadership positions of student organizations. In addition to being a founding member of Iota Phi Theta Fraternity Inc., he serves as the current president for both the Student Government Association and the National Pan-Hellenic Council at SAU. Bailey is also a member of Student Activities Board and has served on its executive board for several semesters. Mulerider Round-Up and Leadership Academy keep him even busier throughout the year. Using these experiences as learning opportunities, Bailey says it is not always easy. Bailey’s passion for self-improvement was encouraged by his interest in the Behavioral and Social Sciences program at SAU. In the foreseeable future, Bailey aims to earn a Masters in Forensic Psychology by age 24, become a certified counselor by 25, and work with the FBI through Forensic Psyhology soon after.